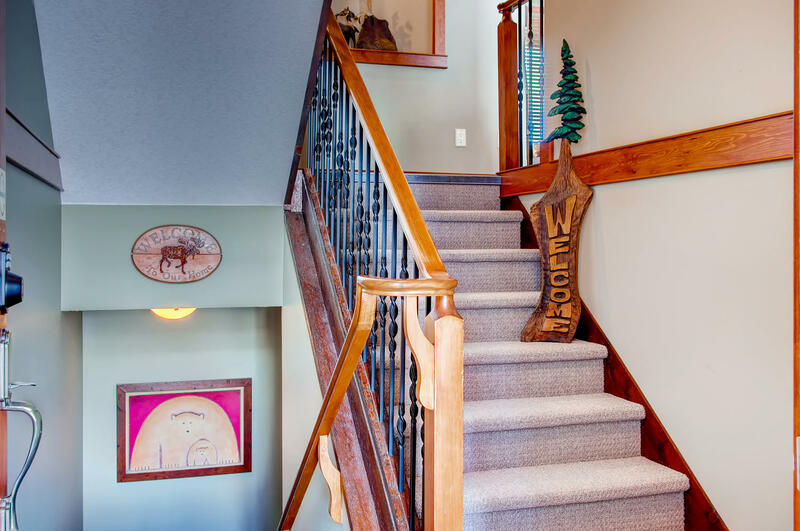 Bring your family, friends and even your pet to stay in this beautiful property which has everything you need for the ultimate ski vacation! 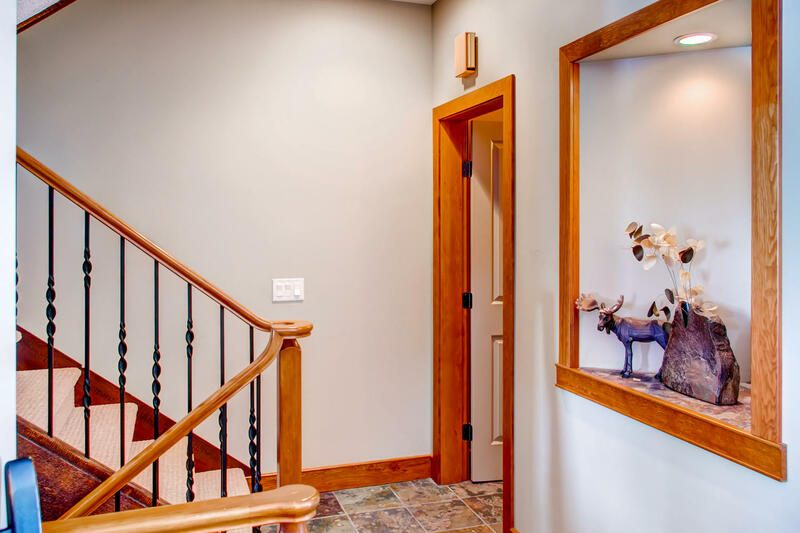 The main entrance to Blacksmith 7 opens up onto a slate landing, a split level entrance with carpeted stairs to the upper and lower levels of this 3 story townhome. The middle level has all the living areas. 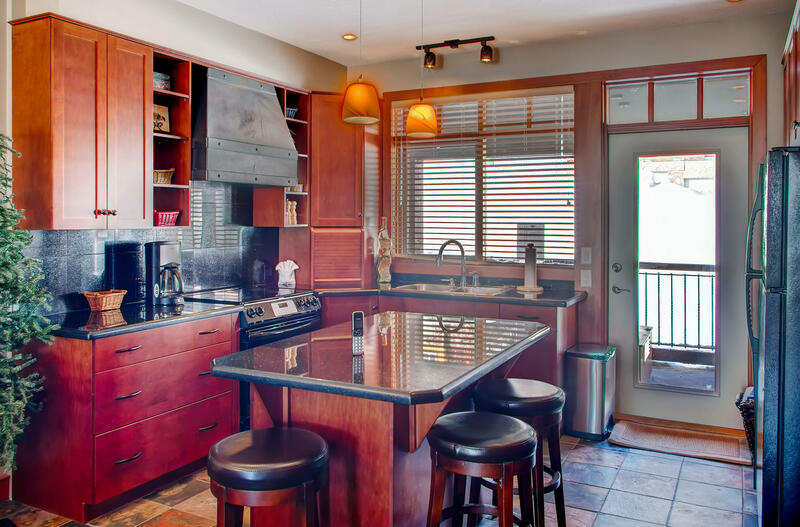 The kitchen has slate floor and dark wood cabinets with black granite work surfaces. With floor to ceiling cabinetry along one wall there is plenty of cupboard space in this well equipped kitchen. The breakfast bar has 3 leather bar stools. Through the kitchen windows there are views up the mountain towards the village and Gondola. The dining table seats 6 comfortably. Off the kitchen is the balcony with the hot tub. Views from here are up to the Big White Village, the mountain, and the Gondola. 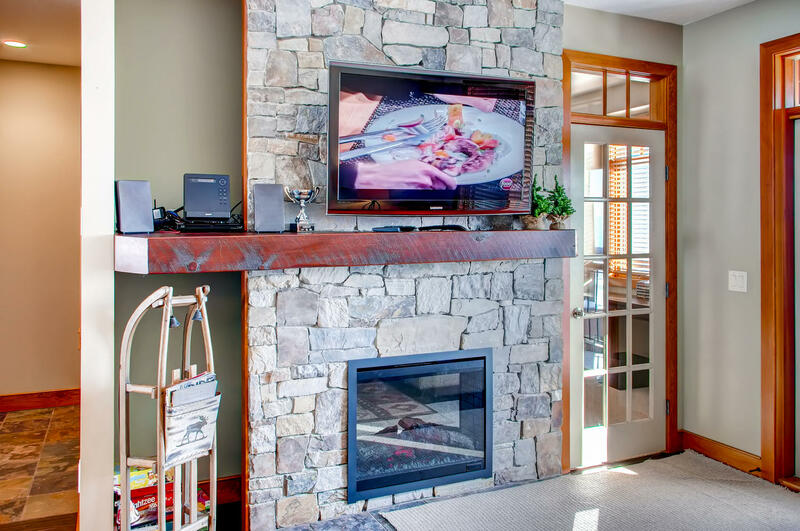 The living room features a large stone fireplace with electric fire. 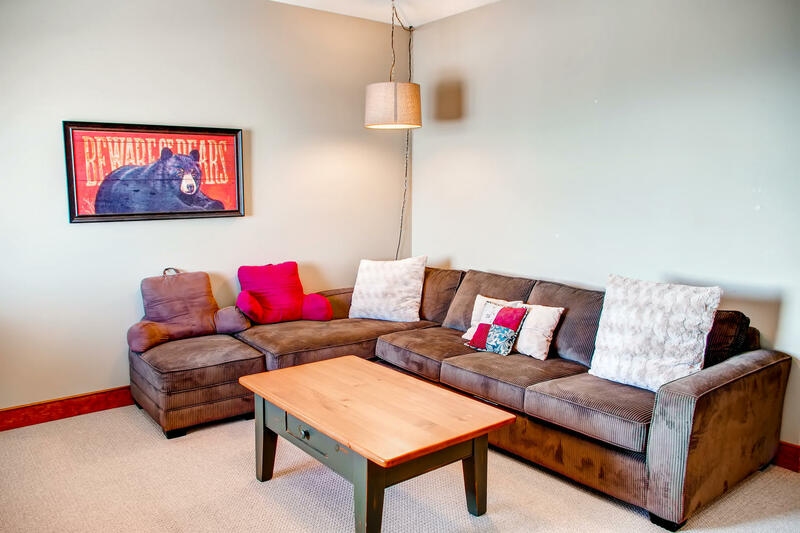 This room has comfortable sofas, coffee table, side tables with table lamps and a 46” flat TV, with DVD Player, Blu Ray, stereo, surround sound and even an iPod docking station. 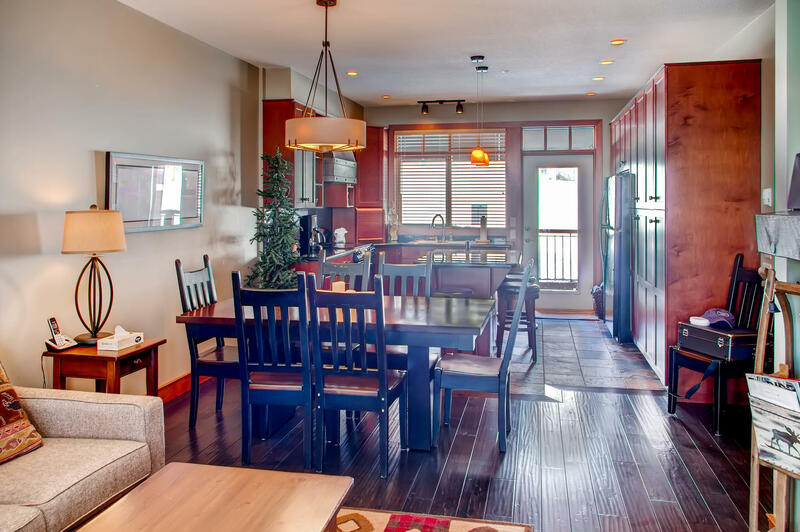 There is a narrow balcony off the living room to admire the amazing panoramic views of the Monashee Mountains. A glass door leading from the living room has a den with an office desk, lamp and a double futon couch. 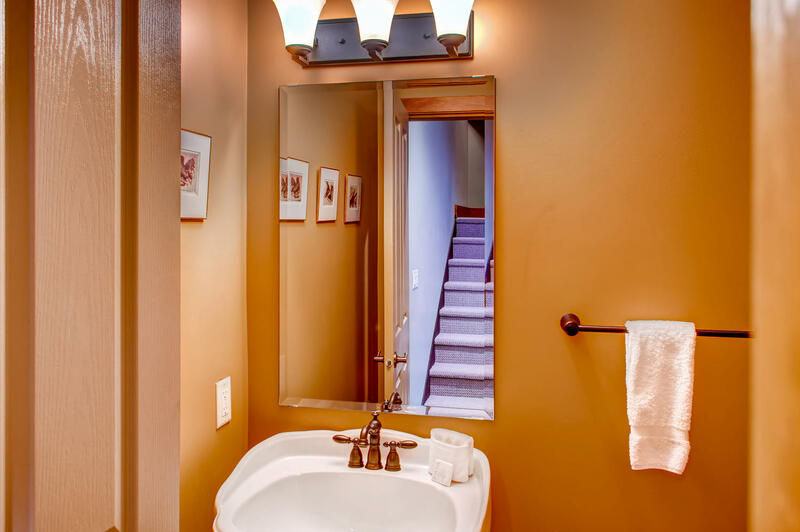 The stair landing has a convenient half bathroom with a toilet and ornate pedestal sink. Upstairs to the top level, on the top landing there is a laundry cupboard with a washer and dryer. On this level there are 2 ensuite bedrooms! 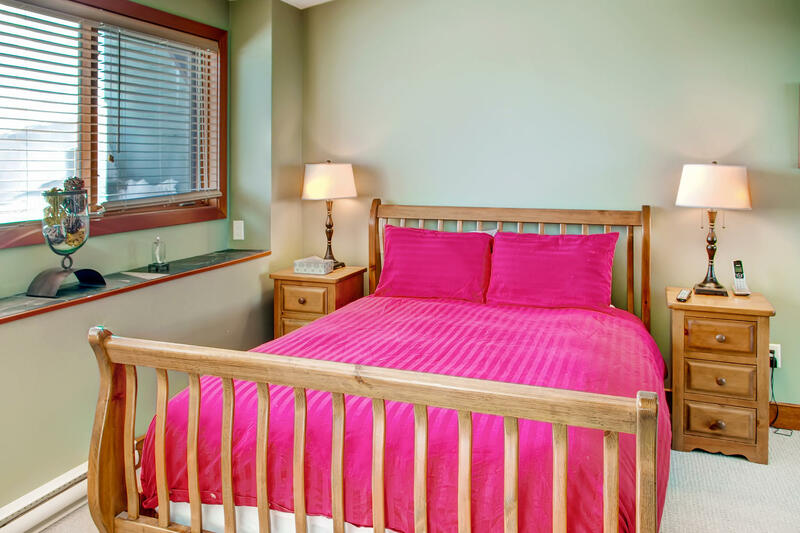 The master bedroom has a queen bed with bedside tables and table lamps. 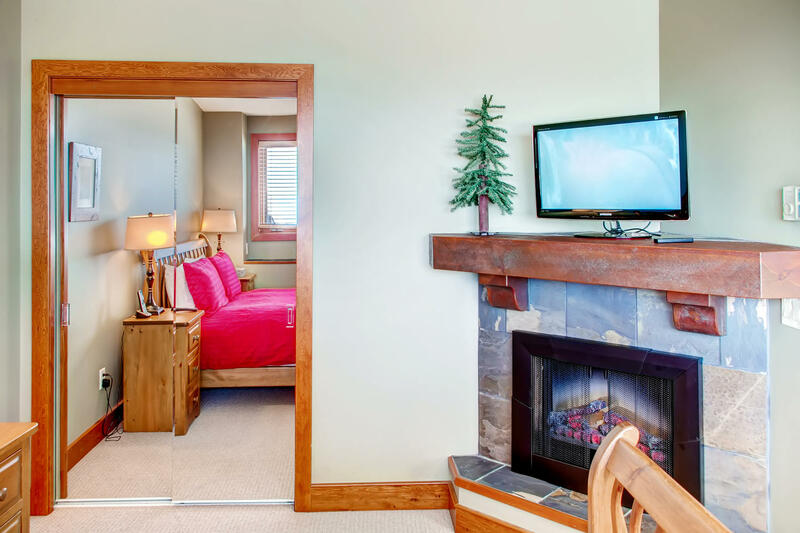 This room has a corner feature hearth and fire, large slate window ledges and a 27” flat screen TV. 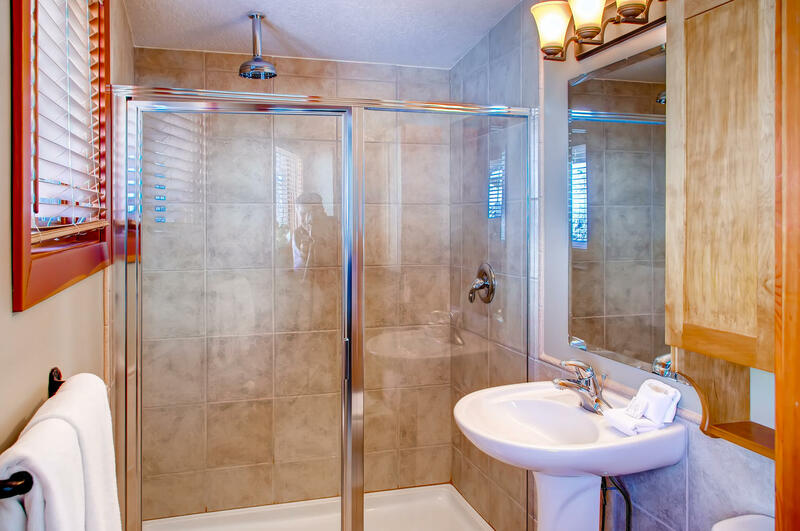 This master has a bath suite with a jet bath tub and an overhead shower. 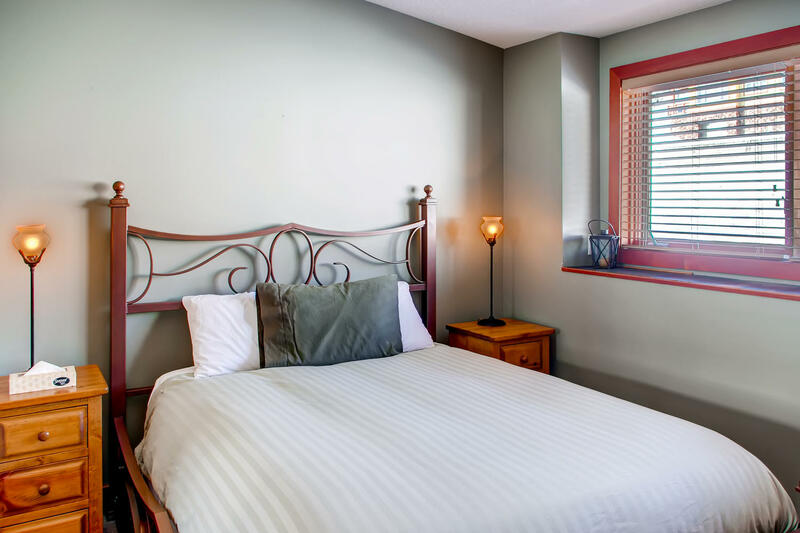 The second bedroom has an ornate iron queen bed frame, with matching lamps on the bedside tables. 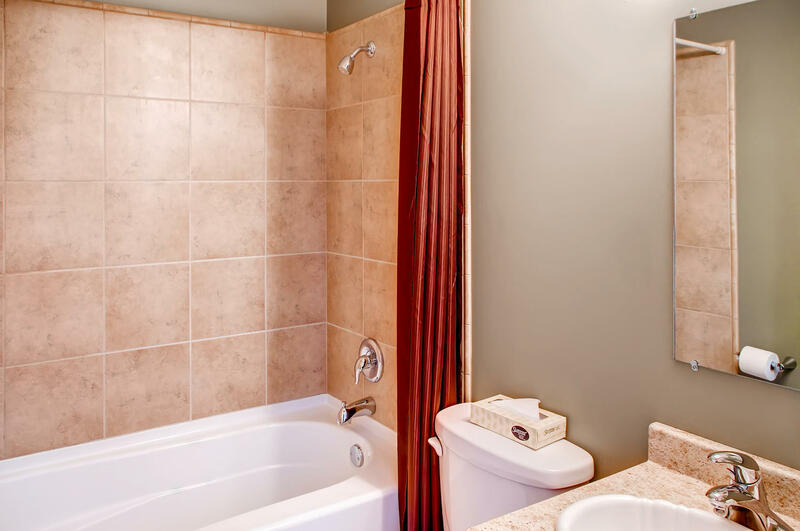 This room also has an ensuite with a large overhead shower head, toilet and pedestal sink. All the way downstairs to the ground floor is a living area/dorm style bedroom, with a bathroom and den area which is ideal for kids. The downstairs living area has a twin bed and a single over single bunk bed tucked in the corner. This large comfy room has a sectional sofa, coffee table and a 31” Flat TV, with a Sony Playstation, a few PS3 Games and a DVD Player. Also has a comfy bean bag chair for game playing! 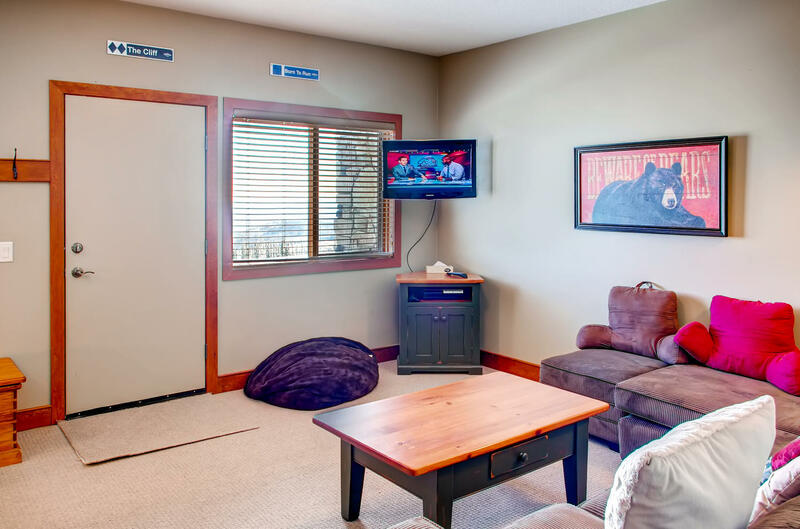 There are 2 doors from this second living area - one leads out to the groomed ski path that leads to 3 lift chairs. 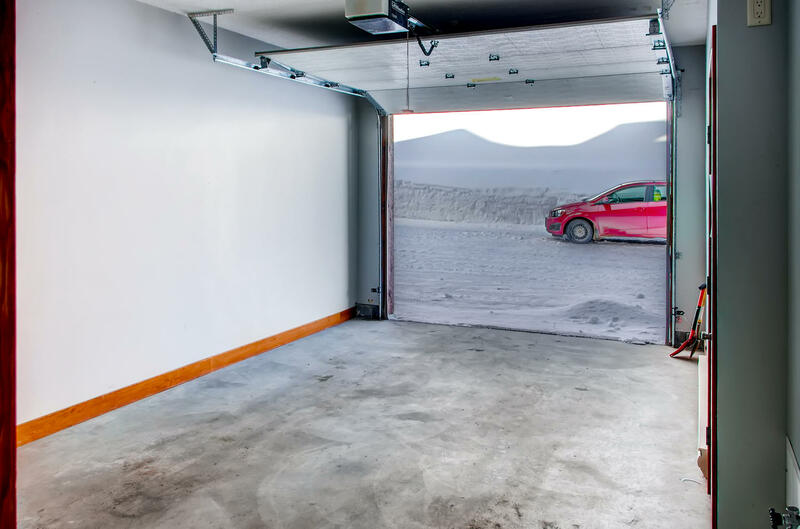 The second door leads to the garage that has a boot drying room built into the wall. 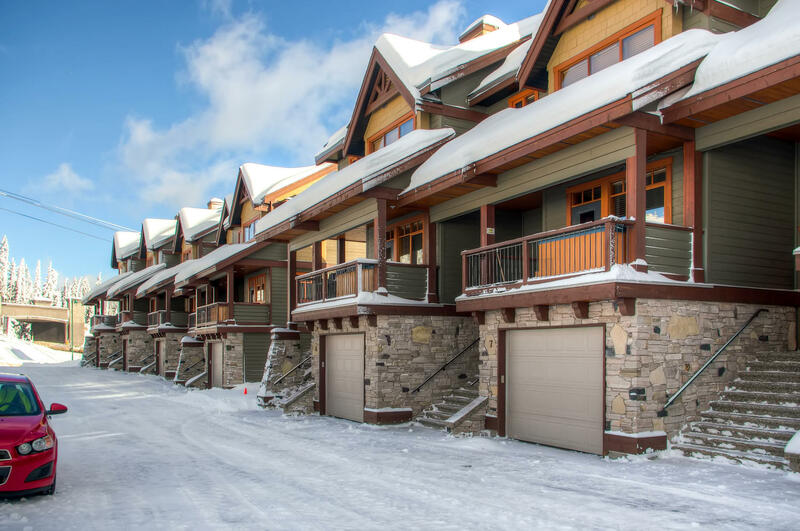 This townhome is on Whitehorse Lane, ski out access is amazing - ski in via Gondola way and drop down just before you come to the bridge. From here it is a short walk over the road to the townhomes. To walk to Big White Village, you would take the path back up to Gondola Way and either walk up the groomed lit path or down the path to Happy Valley where you can take a Gondola ride up to the Village Centre - either way is between 10 - 20 mins journey. Or you can always hop on the Big White Community Bus that circuits Big White during the ski season. Reviewed February 25, 2019 by Unknown of Bellevue, WA United States. Updated on March 14, 2019. Review of stay from February 16, 2019 to February 23, 2019. Great place to stay. 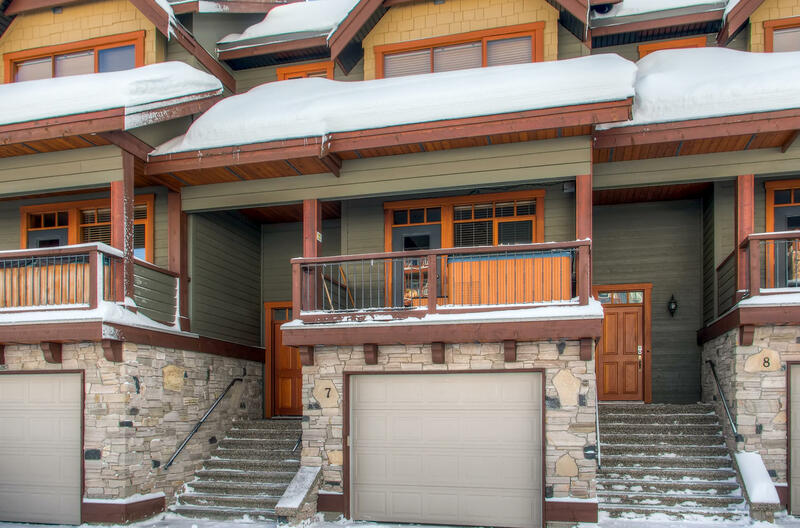 Easy ski in/out, short walk down to Happy Valley and Gondola. Convenient floor plan, ideal for two families with kids. Warm garage with boot warming room was super handy. Pet friendly unit. Would definitely come back and recommend to the friends. We're so glad to hear you had a comfortable and easy stay at this wonderful location! We very much hope to see you back again! Reviewed February 8, 2017 by Matthew Z. of , United States. Updated on February 12, 2017. Review of stay from February 2, 2017 to February 6, 2017. Fantastic stay! Great place. Very close to the hill. Shaz at Rentchalet was awesome and found us a bbq to use and they also hooked us up with a late checkout and were helpful throughout. Thanks for taking the time to review your stay with us at Big White. It's great to hear you had a great time staying at Blacksmith Lodge 7 and we're happy we were able to accommodate your requests for a BBQ and late checkout. We'd love to welcome you back to stay with us again soon! 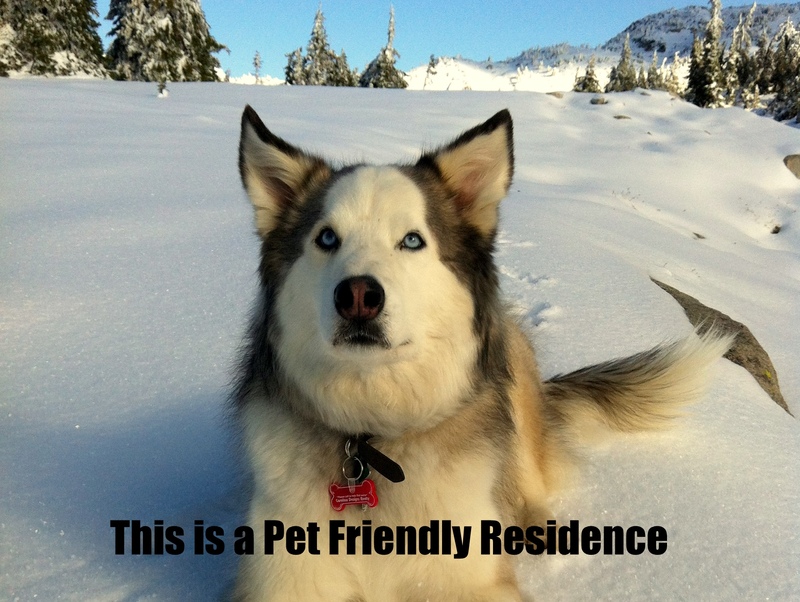 Reviewed December 31, 2013 by Judy K. of Anmore, BC Canada. Updated on December 31, 2013. Review of stay from December 20, 2013 to December 29, 2013. We had an amazing time. Perfect location. Beautiful property, very clean and the staff at Rent chalets were terrific and tended to any of our needs. Can't wait to do it again. We loved Blacksmith Lodge! Rent Chalets made it easy to enjoy. Reviewed March 23, 2015 by Unknown of Pitt Meadows, BC Canada. Updated on March 25, 2015. Review of stay from March 15, 2015 to March 20, 2015. We stayed at Blacksmith Lodge at Big White and the service was easy and convenient and service was very prompt. When we had a problem it was dealt with right away. Personal were all friendly and professional. The accommodation was great and had everything we needed and was kid and pet friendly. We had a blast. Reviewed March 17, 2018 by Unknown of Toronto, ON United States. Updated on August 27, 2018. Review of stay from March 11, 2018 to March 15, 2018. We enjoyed all the comforts of home. Nothing was missing and the place was charming! 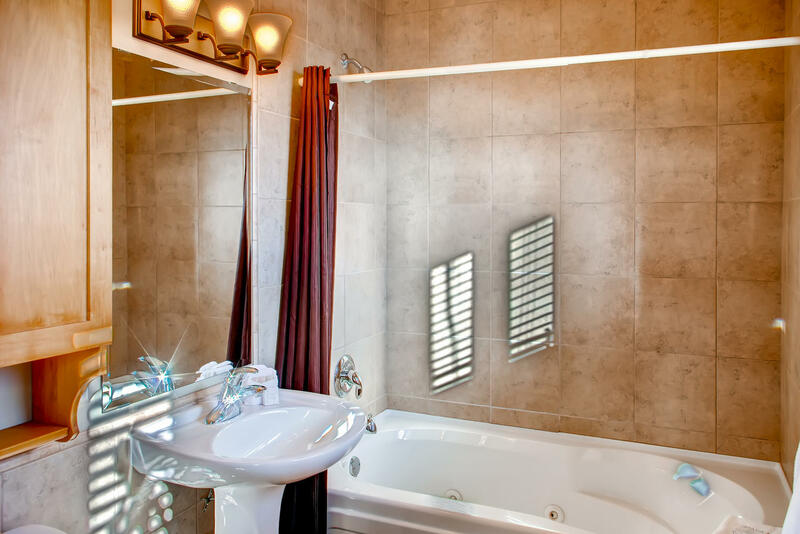 We are pleased to hear the property had everything you needed and that you felt right at home. If there is anything we can do to be of assistance please let us know as we would love to have you stay with us again in the future. Reviewed February 4, 2015 by Unknown of West Kelowna, BC Canada. Updated on February 6, 2015. Review of stay from January 14, 2015 to January 17, 2015. When we arrived the check in was very smooth. The property was in perfect condition and very clean! we really enjoyed our stay!!! Reviewed February 8, 2015 by Jim O. of Naniamo, BC Canada. Updated on February 11, 2015. Review of stay from February 1, 2015 to February 6, 2015. Six guys was max for this property. 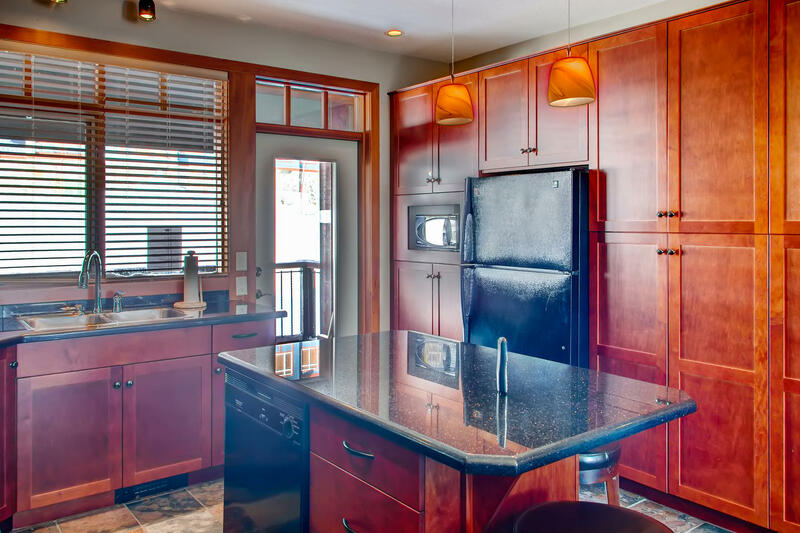 Nicely set up kitchen and easy ski in ski out..
Hi Jim Thanks for your great review of Blacksmith Lodge #7 at Big White Ski Resort. We're glad that you enjoyed the easy ski in and ski out which Big White is famous for. 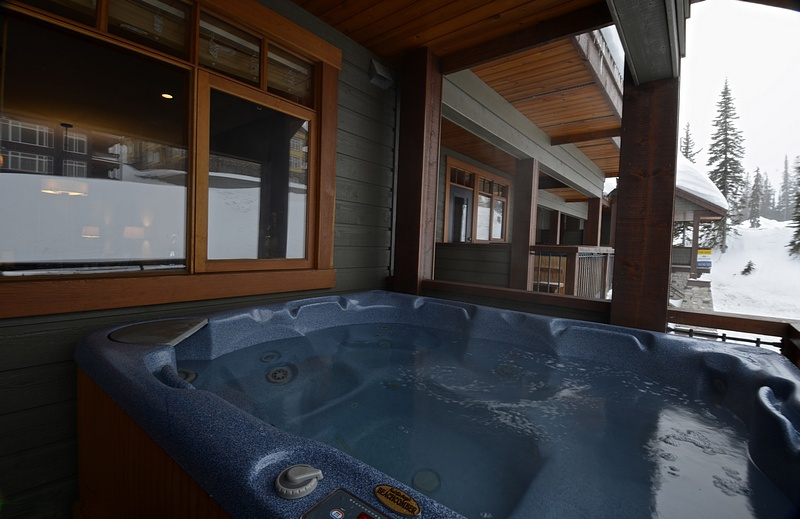 We hope you also managed to find time to relax in the private hot tub and enjoy everything that Big White has to offer. 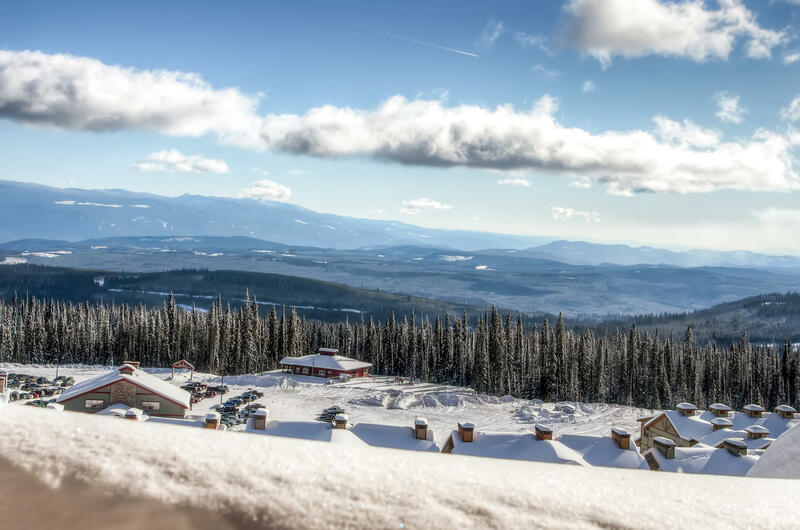 We look forward to welcoming you back to Big White again soon. Regards RentChalets Team. Reviewed March 25, 2013 by Geoff C. of Winnipeg, Manitoba Canada. Updated on April 23, 2013. Review of stay from March 16, 2013 to March 23, 2013. Lots of space for 4 adults and 4 children. Great location - wouldn't recommend skiing out of back door (lots of snow), but 20 yards over you can ski out with no problem. Very clean. Rent Chalets was excellent. Very comfortable beds. Fully equipped. Thank you for your feedback Geoff, we are glad you enjoyed your stay and we are looking forward to having you stay with us again in the future. Reviewed February 1, 2017 by Tatiana G. of Bothell, WA US. Updated on February 5, 2017. Review of stay from January 25, 2017 to January 30, 2017. Pros: Spacious heated garage with boot drying room. Bathroom in every room. Nice view from the dinning area. room layout is convenient. Cons: downstairs room didn't have a door. Rooms didn't have any shelving space where we could keep our clothes and gear. Couches do not unfold to a sleeping space. Hottub is not facing the view. There was no garbage can in downstairs bathroom. Thanks for taking the time to review your stay with us. 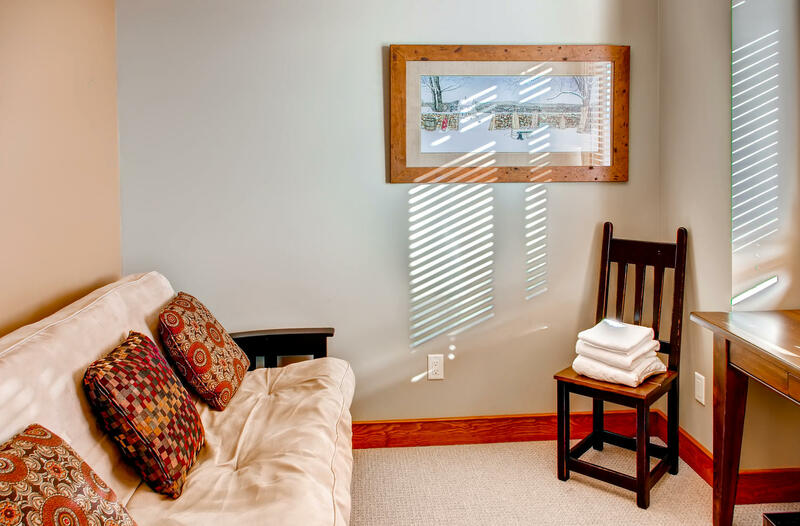 We're glad that for the most part, Blacksmith Lodge 7 suited your needs and that you had a nice stay. 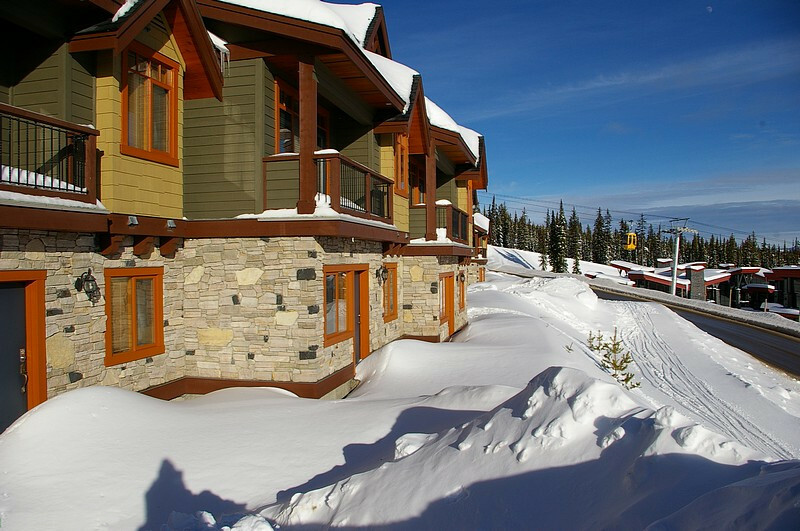 We hope to welcome you back to stay with us at Big White again soon! Reviewed January 18, 2017 by Gregg Z. of Macedonia, OH United States. Updated on February 13, 2017. Review of stay from January 13, 2017 to January 16, 2017. Solid Location. View from the hot tub was the parking lot however. Could've been the valley had the builders given it some lot. TV remotes had no batteries and there were no basic cleaning products to wipe down a counter. Ski out was way easier than ski in. Heated garage is a nice feature. Parking is contrived. Garage cannot handle 2 cars so someone is parking in the lane way with a temporary printed pass. Overall condition of the property was nice. Layout was solid. Adults upstairs, kids in bunks down. Nice touch with a flat screen and fireplace in the master. Check out at 10 AM is an hour too early in my opinion. You have to carry away your own garbage. At $500+/night, you think they could handle that for you. Property mangers were helpful and courteous. I would recommend this property to a friend at a lower price than what I paid. Give it 4 out 5. Reviewed December 30, 2014 by Kate T. of Sechelt, BC Canada. Updated on January 4, 2015. Review of stay from December 21, 2014 to December 28, 2014. Our family had an absolute magical Christmas at the blacksmith lodge! The lodge was everything we expected and more. Ski in/out access was fabulous, even for our wee little skiers and had great access to happy valley and the village. A perfect location! The kitchen could use more cutlery, it felt like we were always washing but that is our only complaint. Reviewed January 3, 2012 by Unknown of kelowna, United States. Updated on January 3, 2012. Review of stay from December 27, 2011 to January 1, 2012. Blacksmith 7 is a beautiful unit! It is beautifully furnished and appointed. Rent Chalets is fantastic to deal with! Overall, I am very satisfied. I have 1 recommendation/clarification - the ad is somewhat misleading, as in a 3 bedroom. The 3rd bedroom is a rec room off the garage without a door and not technically a bedroom. It does have 3 bunk beds and is a great kids space. A week in Big White! Reviewed January 9, 2018 by Lorraine D. of Markham, ON United States. Updated on August 30, 2018. Review of stay from January 2, 2018 to January 7, 2018. A great townhouse in a good location. My only feedback for improvement would be to update the kitchen plates, pots etc. Many were chipped and the poor quality of the cooking pans etc made it more difficult to cook. We are pleased to hear that you enjoyed your weeks stay at Big White. We appreciate your suggestions to help keep up our properties and are glad you were able to enjoy the property. We would love to have you stay with us again and if we can provide any assistance, do not hesitate to ask. Reviewed February 14, 2012 by Clause L. of , United States. Updated on February 14, 2012. Review of stay from February 10, 2012 to February 12, 2012. We are a group consisting of two families and found this vacation rental absolutely ideal for what we needed. The kids loved all the games and of course the hot tub and us parents, loved the fact that there was a playroom downstairs. Great location and nicely appointed...we didn't need was all there. Thanks Rent Chalets for an unforgettable weekend. Reviewed January 26, 2016 by Kate T. of Sechelt, BC Canada. Updated on February 29, 2016. Review of stay from January 19, 2016 to January 24, 2016. 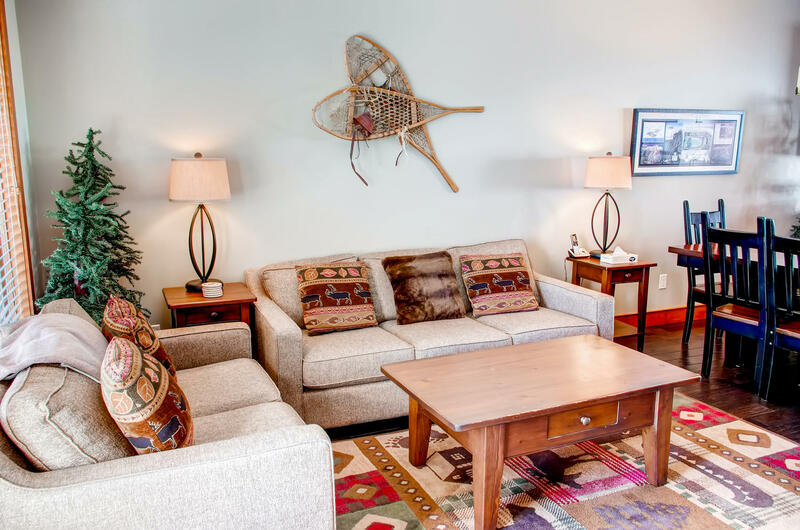 Blacksmith lodge is a fantastic place for a large family to stay! This was the second time we've rented here and we will definitely be back. Reviewed December 29, 2015 by Katrin S. of Vancouver, BC Canada. Updated on January 4, 2016. Review of stay from December 20, 2015 to December 27, 2015. Overall we were mostly happy with our rental, however, there were some problems that we think need to be addressed. 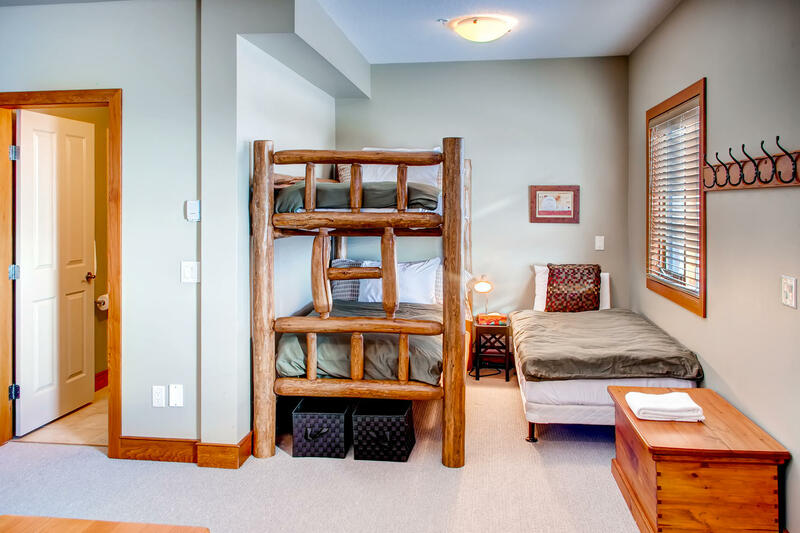 The bunk beds in the lower room are *terribly* uncomfortable; the mattresses sit on a slant and are supported on a flat piece of wood, instead of proper bed slats. The whole bunk is made of logs that are a wobbly assembly. It seems a little home-made, which isn't reassuring in a bed you, or your kids, are climbing into, or out of, in the night. The cleanliness wasn't 100%; there was visible dirt under every piece of furniture and a used bandaid in one of the beds. The kitchen faucet was broken. As with almost every condo we've ever stayed at in Big White, noise is an issue (we've stayed in 6 different units/buildings over the years). There is zero sound proofing between floors of the unit, so settling young kids for the night when the adults are still awake was tricky. Meanwhile, when the kids are up early, jumping in the living room, the adults downstairs were woken immediately. We didn't notice sound issues between units next door, however. The location is good for ski out, not as good for ski-in. (There's a cat track down to the Plaza/Snow Ghost/Ridge Rocket. Coming home you need to come down via the Walking Path between the Village and Happy Valley, under the Gondola, and it's a bit of a scoot down the hillside to the parking lot, and/or you need to cross Big White Road on foot. If you're not skiing, you can always walk DOWNHILL to get to Happy Valley (to the gondola) or, from the Village to the condo, via the Walking Path, which is nice. There is a short walk uphill to access the path, however, which might be tricky for some. This unit sleeps 9 people, but the common area is too small for 3 separate families, as in our party. 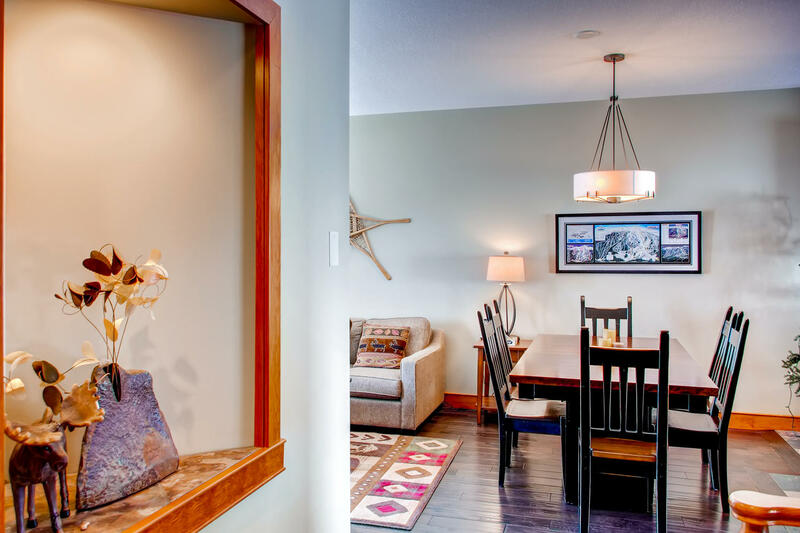 The common area is all on one level - living, dining and kitchen, then two patios, one with hot tub. Reviewed April 4, 2016 by Dawn D. of Calgary, AB Canada. Updated on April 4, 2016. Review of stay from March 16, 2016 to March 19, 2016. The few issues I had with this was they only had three nights available and yet I was charged a "short stay fee of $400" Also, the list of how ey wanted the suite left was ridiculous. Take the garbage out and locate the nearest refuse spot, run the dishwasher but be sure to stick around and put the dishes away. When evaluating the over $500 per night charge, one would have hoped they would have employed a cleaning crew. The staff was very nice to deal with and location was good (not great).